Taisho-Tei Ramen, unique for its home-style ramen with the original taste from Japan, has rolled out Super Limited Menu featuring a lineup of special ramen creations that will satisfy your ramen cravings. Highlight of the menu is giant ramen (399 baht) that can be shared by 2-3 persons which comes with two choices including Tonkotsu Spicy Super Ramen and Tonkotsu Super Chashu-Men. Other menu items featured in the menu include Tori Paitan Ramen, Paitan Cabbage Soup, a soothing bowl of ramen with mild-flavored broth, Buta Sukiyaki Udon, a great combination of sliced pork with juicy Udon noodle, Tonkotsu Spicy Ramen, Super-Hot Ramen, Spicy Ramen and Tomato Tom Yum Seafood Ramen to spice up your ramen experience. Cheese lovers don’t miss to try out Double Cheese Tonkotsu Carbonara and Cheese Gyoza as the appetizer. Come and enjoy the full flavor of home-style deliciousness with these special ramen creations at Taisho-Tei Ramen at IMPACT Muang Thong Thani and BEEHIVE Lifestyle Mall throughout February – April 2018. For more information and updates from the restaurant, please visit Facebook fan page Taishotei Ramen and Instagram taishotei_ramen. Taisho-Tei Ramen is an authentic Japanese-style ramen restaurant offering home-style ramen dishes in rich and flavorful soup broth originated from different regions of Japan. The restaurant was first operated in Thailand in 2014 at Food Atrium, IMPACT Challenger 3, Muang Thong Thani (Tel. 02-833-4284), followed by the second branch at BEEHIVE Lifestyle Mall (Tel. 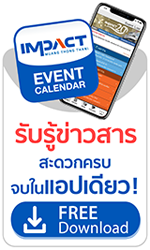 02-060-9370), and the third branch at Sky Kitchen, IMPACT Challenger 3, Muang Thong Thani. For more information, please visit Facebook fan page: Taishotei Ramen.